A POS system is a must-have item for any cafe that wishes to stay competitive in today’s market. The right POS system can help you quickly deal with a morning rush, keep track of inventory, give you insight into which items sell best, and help manage your employees. While some companies offer the same general POS for restaurants, retail establishments and quick serve operations, others offer features that are specifically tailored to the needs of cafes and coffee shops. What Do Cafes Need From Their POS Systems? Cafes and coffee shops have unique needs that are not common to standard restaurants. Let’s take a look at some of these areas in which the right POS system can make all the difference between an inefficient mess and a smooth, modern operation. Double soy vanilla cappuccino with cinnamon on top instead of chocolate? Getting your customers’ orders correct has never been easier thanks to the modifying options included in cafe POS systems. People are more particular with how they like their coffee than they are with just about any other food or beverage item. You’ll have options to add or remove any component of a coffee drink directly on your touch screen with the right POS system. For owners of cafes and coffee shops, counter space is valuable real estate. 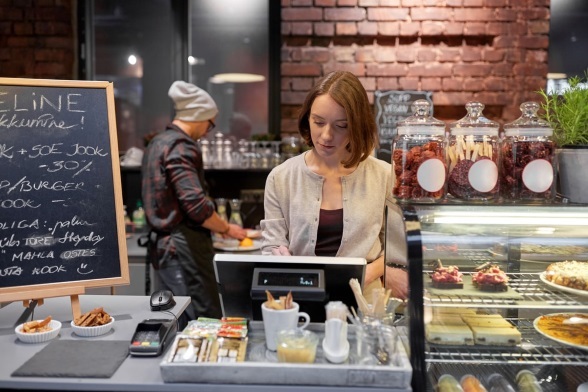 Compared to a bulky cash register, or even a traditional POS, the tablet POS systems made for cafes take up very little space, allowing you to keep your counters tidy and your workflow unhindered. Cafes and coffee shops cannot afford to have slow lines that wind out of the door into the street. You should be able to place complex orders on your POS with the touch of a button, flip your screen so customers can sign digital credit card slips, and take your operation mobile to take orders and payments throughout the line with a handheld device. If you make your customers late for work, they might not come back. As a cafe owner, you have the opportunity to get daily, repeat customers. An automatically-tracked customer loyalty program that rewards customers with discounts and free items for purchases is an effective way to win repeat customers that requires no effort. With the right POS system, you can manage such a loyalty program digitally, without having to physically punch a card. Knowing what to order and when is a necessity for a coffee shop or cafe that wants to run smoothly. A cafe POS cannot only tell you how much of each coffee drink or food item is selling, it can count the individual ingredients being used and let you know when supplies are low so you know when to reorder. Now that we’ve discussed the benefits of a POS system designed specifically for cafes, let’s take a look at the leading companies in the field. ShopKeep is an iPad POS solution that specializes in serving small- and medium-sized quick service restaurants, like coffee shops and cafes. With the bulk of customers looking for coffee coming in a set rush period before 11 a.m., ShopKeep focuses on speed, to get through lines quickly and efficiently. In a business with relatively small margins, every bean counts, so ShopKeep's inventory tracking helps you stock what is selling well and avoid ordering products that are just sitting on the shelves. ShopKeep also helps you market your coffee shop and remind customers to come back for more. Its marketing tools allow you to capture customer emails when they pay, then use email marketing platform MailChimp to send them coupons and friendly reminders. TouchBistro​ is a POS that is made specifically to serve restaurants and service industry businesses, with specific features for cafes or coffee shops. Rather than a bulky POS or cash register, TouchBistro's iPad POS helps make the best use out of valuable counter space. You can also go mobile, taking orders away from the counter. TouchBistro offers easy modifiers that are ideal for the specialty orders you get at cafes or coffee shops. When customers have special requests, such as no foam, extra hot, or soy milk, you can add custom modifiers on the fly or make use of common modifiers already built into the system. With TouchBistro you can easily accept multiple payment types, including cash, debit, credit card and mobile payments. The ability to provide bill-splitting capabilities at tables is also a convenient option to offer customers at cafes. TouchBistro also offers self-ordering solutions for those who are interested in providing such a service. It's a good way of reducing labor costs and speeding up the ordering process by offering multiple do-it-yourself payment stations. Revel is an iPad POS system that is ideal for busy cafes that cannot afford to have any downtime. Its offline mode allows businesses to continue processing orders even in the event of an internet slowdown or outage. Revel's POS system allows cafes to design, create and display their own custom menus. In addition, it tracks not only menu items, but ingredients, so you know what to restock. The platform goes beyond merely allowing you to accept payment, allowing you to manage employee schedules, hours worked, and payroll. Particularly useful for cafes that wish to retain customers is the Revel feature that allows you to offer customer loyalty programs by keeping track of individual customers' purchases and offering them rewards for continued patronage. Harbortouch​ is not an iPad POS system like the other firms on this list, but rather it has its own hardware that is customizable for different kinds of establishments, such as cafes. Harbortouch provides its POS equipment for free for businesses that sign a long-term credit card processing contract. Harbortouch's Echo POS system for small business has 3 different modes to choose from, depending on how simple or robust a system you need for your cafe. 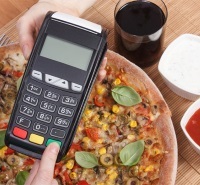 The modes include a basic calculator for quick sales, a common cash register setting or a full function POS. The full function POS allows you to track sales and inventory, keep track of employee hours and tips, and perform back office functions from any computer on the cloud. Toast is an Android POS system that has hardware specifically for cafes. 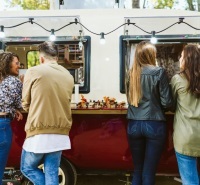 Capabilities such as flip screens to speed up ordering and handheld ordering and payment options to deal with lines, are made to meet the challenges of the unique rush hour morning traffic that is common to coffee shops. 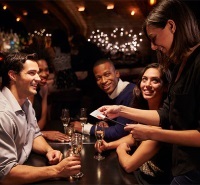 Toast also features integrated reward and gift card programs to help bring customers back by improving their experience. Detailed reporting and analytics let you analyze your most popular items and your busiest days of the week and times of day. Toast is designed for a dynamic environment, allowing users to make changes to the menu quickly and easily directly from the POS. Getting set up with a POS system for your coffee shop or cafe is quick and easy, and the benefits are clear. See our in-depth reviews of the leading POS systems for more information, and choose one that’s right for your business.